After taking a much deserved vacation in Charleston, SC we returned home the other day by way of the mountains in Western North Carolina. We traveled across the entire state of South Carolina to Lake Lure, NC this past Sunday. What a trip! I thought it was so cool to say that we drove from the beach to the mountains in the same day. It reminded me of the lyrics from the song "God Bless America". 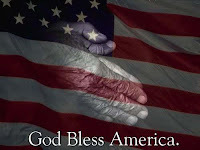 God Bless America and America Bless God!